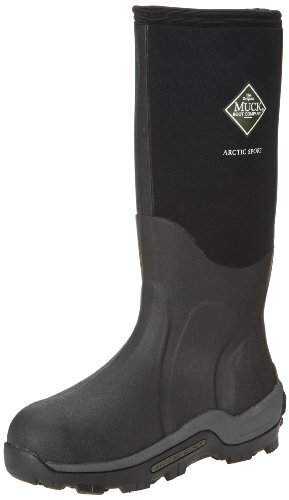 Ideal for outdoor work or leisure activities during frigid weather, Muck Arctic Sport Rubber High Performance Men's Winter Boots will keep your feet warm in temperatures as low as -40 °F (-40°C), even when you're standing ankle deep in snow and slush. Offering both support and comfort, these insulated boots have a contoured midsole and warm fleece lining with thermal foam under the footbed. The 5 mm neoprene in these men's snow boots offers numerous benefits: it's waterproof, it absorbs shock, retains heat and prevents chafing by adjusting to the natural contours of the feet. These men's winter boots with molded lugs are built with a fully-sealed rubber shell that extends high above the ankle for extra protection when walking in deeper snow.